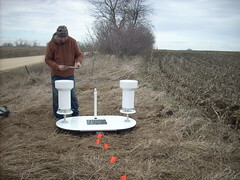 Jim Niemeier installs an Iowa Flood Center rain gauge and soil moisture platform in NE Iowa. The Iowa Flood Center (IFC) is helping answer the second question with a high level of accuracy, thanks to new state-of-the-art technology. IFC researchers have designed and installed 20 state-of-the-art rain gauges with soil moisture probes in the Turkey River watershed in northeast Iowa, with a few more gauges in the South Fork of the Iowa River watershed (Franklin, Hamilton, and Hardin counties) and the Walnut Creek watershed (Jasper County). A total of twenty-eight Iowa Flood Center rain gauge and soil moisture platforms were deployed across three Iowa watersheds in April 2013. In addition to measuring precipitation totals, the new gauges also measure moisture and temperature of the soil. The units are solar powered and transmit data via a built-in cell modem. The information is displayed on IFIS with a user-friendly graphic interface. Choose the State Overview option on the dashboard and click ‘Launch’. In the upper right corner of the screen, hover your mouse over the DATA RESOURCES tab and click the box next to Rain/Soil Moisture Gauges. Click on a gauge icon to get more details from that location. From here, you can click to view additional rain gauge or soil moisture info for the site. In IFIS, users can view real-time data from the gauges including soil moisture and soil temperature at depths of 2″, 4″ 8″ and 20″ near the gauge. The new deployment of rain gauges is part of the Iowa Flood Studies project, also known as IFloodS, undertaken this spring in partnership with NASA. IFloodS researchers are collecting ground data across Eastern Iowa as part of NASA’s Global Precipitation Measurement Mission, an international satellite mission that will set a new standard for global precipitation measurements from space. Based at IIHR—Hydroscience & Engineering at the University of Iowa, the Iowa Flood Center provides accurate, state-of-the-science-based information to help decision-makers, individuals, and communities better understand their flood risks. The Iowa Flood Center has announced that the Soap and Chequest Creek, Turkey River, and Upper Cedar River watersheds will each receive a $1.5 million grant for construction of watershed improvement projects to support flood mitigation, such as farm ponds, wetlands, and floodplain easements in a targeted area of the watershed. The grant, provided with funding from the U.S. Department of Housing and Urban Development, is part of the Iowa Watersheds Project, an effort of the Iowa Flood Center at the University of Iowa. Watershed improvement projects will be constructed in the Soap and Chequest Creek, Upper Cedar, and Turkey River watersheds. In the coming months, local watershed boards, with the help of the Iowa Flood Center (IFC), will identify a subwatershed in which to target the grant funding, with initial project construction expected to begin in 2014. Professor Larry Weber, an IFC researcher and director of IIHR—Hydroscience & Engineering, says his hope is that the Iowa Watersheds Projects will improve our understanding of what works best in each watershed, and which strategies can be scaled up for implementation throughout the state. IFC teams are currently conducting hydrologic assessments of the watersheds to help researchers understand how water moves in the basin, and where constructed projects will have the greatest impact on reducing downstream flood damages. IFC researchers have been working with local partners in each watershed to learn about the basins and their residents, to share information, and to build a consensus about future projects. Weber says that building strong working relationships is crucial to the project. “Landowner participation and watershed engagement are the most important elements,” Weber says. Since its establishment in 2009, the Iowa Flood Center has significantly improved the state’s level of flood preparedness. Based at IIHR—Hydroscience & Engineering at the University of Iowa, the IFC provides accurate, state-of-the-science-based information to help decision-makers, individuals, and communities better understand their flood risks. The IFC’s primary objective is to improve flood monitoring and prediction capabilities in Iowa, while also developing strategies to help mitigate and prevent flood damage in the future. The Iowa Flood Center is collaborating with NASA in the spring of 2013 on a project called Iowa Flood Studies or IFloodS – a project to enhance the understanding of precipitation events worldwide. The Turkey River Watershed has been identified as the study area for a uniform deployment of 15-20 rain gauges with soil moisture probes throughout the watershed. The Iowa Flood Center is seeking assistance from private landowners and public entities to find sites within the watershed to deploy the rain gauges for this project. Proposed locations must meet the following site requirements. A new web-based flood preparedness tool developed at the Iowa Flood Center (IFC) can help Elkader residents know what to expect from the Turkey River at times of high flows. The new Elkader flood inundation maps are available to the public on the Internet through the Iowa Flood Information System (IFIS), an interactive Google Maps-based online application. Homeowners and business owners will now be able to see how predicted flood levels might affect their individual properties. With these maps, Iowa Flood Center researchers are taking the guesswork out of future flood scenarios for Elkader and several other Iowa communities. When floods struck Iowa in the past, uncertainty was part of the problem. Property owners were unsure if projected floodwaters would reach them, and how they ought to prepare. The detailed flood inundation maps are available online for a number of Iowa communities including Cedar Rapids, Charles City, Des Moines, Elkader, Hills, Iowa City, Mason City, and Waterloo/Cedar Falls. Additional communities will be mapped in the future. To use the interactive online maps, use the Iowa Flood Information System (IFIS). Launch IFIS, and click “Flood Maps” to view the inundation maps. Iowa Flood Center personnel traveled to Elkader, Iowa to discuss flooding on the Turkey River.